After last year's stint as Roky Erikson's backing band‚ Okkervil River has again relinquished control to front man Will Sheff. And while Sheff's impassioned narratives are still the centerpiece of each song‚ I Am Very Far distinguishes itself from typical singer/songwriter fare by offering an orchestral wealth of strings‚ brass‚ keys‚ drums and more on every track. A departure from the dual album spanning narrative of The Stage Names and The Stand Ins‚ the poetic lyrical fragments of I Am Very Far still provide vivid imagery‚ but they do so in bite sized increments. 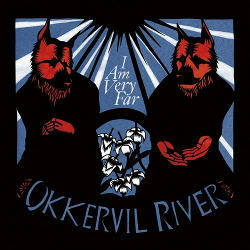 But Okkervil's lack of an overt‚ overarching theme has by no means lead to a lack of ambition. Far takes Sheff's skillfully morbid lyrics‚ which are strong enough to command full attention in their own right‚ and compliments them with layers upon layers of melody to fit his current mood and tone. The album conveys a sense of urgency from its opening moments‚ with crushing percussion and Sheff musing about watching the sun set while a friend suffers from a gunshot induced head wound. Though the album is sprinkled with instantly accessible moments‚ the bulk of the album dwells in a cryptic corner of the subconscious‚ where truths are available but never clearly stated. But what Sheff leaves lyrically obscured‚ gains point of view and personality from Okkervil's vibrant instrumental collective. Deftly streaming from the mellow funkiness of "Piratess" to the piano balladry of "Hanging From A Hit" to the retro sing along "Your Past Life As A Blast‚" Okkervil River continually prove that their chops reach far beyond the straightforward indie rock they're known for. The band's dense arrangements inevitably direct some of the attention away from Sheff's wordsmith wisdom‚ but for the most part‚ the varied elements of Okkervil's sound blend impressively well together. Such layering of sound provides an almost overwhelming amount of subtleties to unpack‚ but the album holds many hidden rewards for those willing to dig deep enough. The most commonly recurring image on I Am Very Far is that of throats‚ and their potential to be slit. If it's Sheff's throat that's in danger‚ at least we can be grateful that he packs so much life into every last gasp.